Address: Plaza Portal de la Pau, s/n, 08001 Barcelona, Spain. The Columbus Monument or the Mirador de Colom is dedicated to the famous Spanish explorer Christopher Columbus who discovered America. 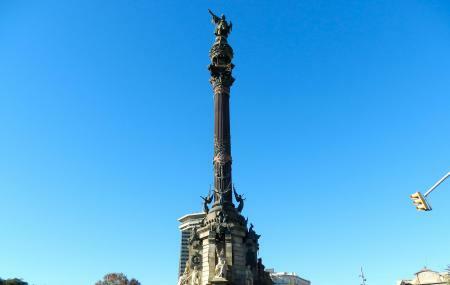 It was erected in 1888 and is located at the end of La Rambla. There is a viewpoint atop the monument and visitors can ride an elevator to the top. The 360-degree panoramic view of the city is spectacular and one can spot several well-known attractions and buildings. On top of the pillar is a statue of the man himself. It was intended to depict him pointing to the west in the direction of the New World. However it turns out that he is pointing to the east towards his home city of Genoa. Built as a tribute to the man who discovered America, the Columbus Monument stands high overlooking the beautiful city of Barcelona, attracting hordes of visitors coming here to witness the scene. There are certain Columbus Monument Ticket Prices for entrance which you can avail directly from the premises. The Tickets for Columbus Monument differs for adult and children with a slight concession in the Columbus Monument Ticket Costs for Children. Barcellona Cards holder will not need to buy Columbus Monument Tickets to enter. Visit early to Buy Tickets for Columbus Monument to avoid any hassles. Visit the place and experience the panoramic view of the city. Last lift ride is 30 minutes before closing time. Wheelchair accessible entrance is located on La Rambla. Columbus Monument Address: Plaza Portal de la Pau, s/n, 08001 Barcelona, Spain. How popular is Columbus Monument? People normally club together Poble Espanyol and Arc De Triomf while planning their visit to Columbus Monument. I give 5 stars to visit with the wine package and I will explain why. The elevator to the top and the top view is quite block by the statue itself. So you cannot see to clear the city and it is pretty short. I would not waste money on that alone. But if you also take the wine package you will get a glass of wine in some wine bar underground just a beautiful place... and the workers there are sooo nice. They just made us the whole visit just perfect. I thing who they work for is lucky. Thank you. It’s a very good place with very good viewing. I went there with my friends and we spent there a very good time with each others. We took good photos with the great views and the monuments which we saved as one of the most happy moments we spent together. I recommend this place to go with a good quality camera to take some great photos. Lovely architecture. Walking on the streets of Barcelona, This monument catches your eye. Me n my friends had a discussion on who it is and why it has been built. It’s a long story. We enjoyed the time there and clicked beautiful pictures to preserve our memories. Hats off to the service staff to keep it so well maintained and clean. Cool place that always reminds me of Donald Duck going off to hunt for a stolen picasso for some reason. Gives a powerful image of the age of exploration. You can also enjoy views from the top.